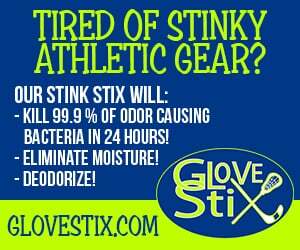 GloveStix are a patent pending odor management system that, when placed into your sports gloves or shoes after practice or games, absorb harmful moisture, eliminate odors, and inhibit 99.9% of odor-causing bacteria growth on the product surface. They work well in lacrosse gloves, hockey gloves, goalkeeper gloves, skates, sneakers, boots, boxing gloves, and more. They’re available to purchase here. GloveStix are available for $29.99 USD per pair here. After testing the GloveStix in both a stinky pair of soccer cleats and a sweaty pair of goalkeeper gloves, I am truly impressed with how well the product works. They do an amazing job of eliminating the odor and moisture in my cleats and gloves in just 24 hours, which is super convenient if you have practice or games two days in a row. I come home from practice, put the GloveStix in my cleats, and they are as fresh as new and ready to go for the next day. All the moisture miraculously gets absorbed by the sticks, and the foul, sweaty odor is eliminated. GloveStix were also able to absorb the moisture in my goalkeeper gloves, keeping them dry, comfortable, and stink-free. It’s uncomfortable to put back on damp, sweaty, smelly gloves after a hot summer session; thankfully, with GloveStix, I don’t have to anymore. The two fresh scented inserts last for about 3 months (depending on the amount of moisture in the shoes or gloves) before they need to be replaced. Refill bags are available for $7.95 USD (Set of 2) on their website. For $29.99 USD per pair, GloveStix are a great investment for players with stinky sports equipment. They are capable of working in lacrosse gloves, hockey gloves, goalkeeper gloves, skates, sneakers, boots, boxing gloves, and more. Overall, I am very satisfied with how well GloveStix held up to their odor eliminating, moisture absorbing, and bacteria inhibiting claims and definitely recommend them to all athletes with stinky gear. You can pick up a pair for yourself here.